Your customer is the most important asset you can have. You need more. Define your customer, and the Alliance Compass will point your alliance partners to more customers. 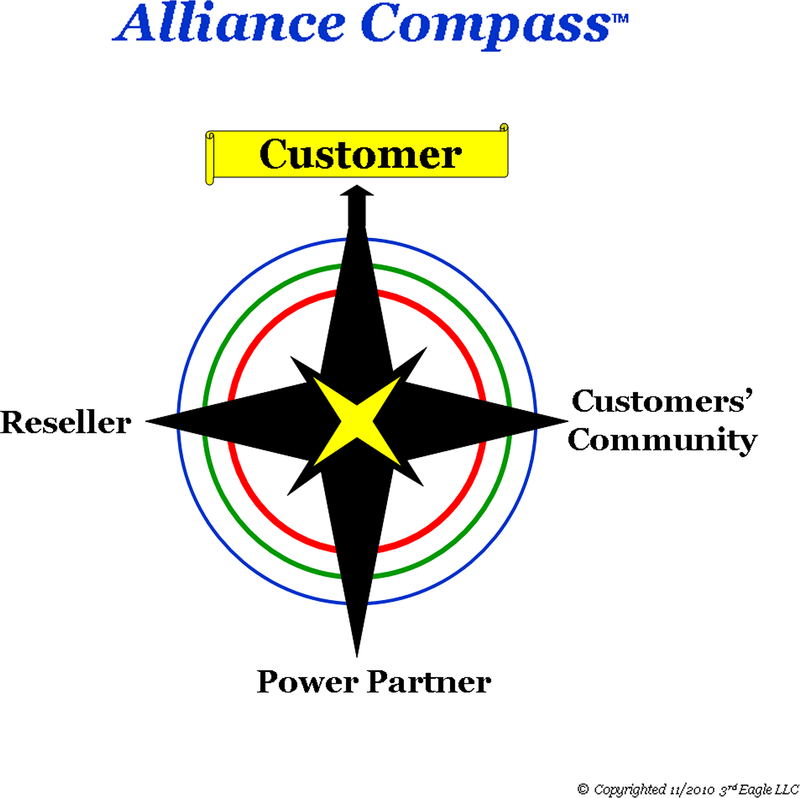 The first step in using the Alliance Compass is to define your current and future customers. They are defined by demographics, psychographics, behavior and their environment. Knowing your customer is instrumental. Once ideal customers are clearly described, we work with you to find the best cost effective strategic alliances to grow your business. Customers’ Community: This is where your customer lives and breathes. Are you there? Do you help them grow within their communities? The online communities are tribes, and you need to be there. By being part of your customers’ community, they will find you. Power Partners: These are the industry catalysts that provide services and products to your customers. PowerPartners find you other customers with little effort, which shortens your sales cycles and increases your profits. Finding and managing PowerPartners is key for the success of these strategic alliances. Resellers: For companies that produce products or services, resellers could reach new markets without much effort on your part. Resellers come in many forms such as: dealers, Value Added Resellers (VARs), Original Equipment Manufacturers (OEMs), or even joint ventures. Resellers require a concerted effort and a management effort for them to succeed. At the center of the Alliance Compass is a gold star for Conditions of Success (COS). Whenever you enter into an alliance, your success is determined by your COS, which you establish up front with your alliance partners. Within the Alliance Compass, there are 3 rings. These rings represent the geography, market niche and lifecycle of your strategic alliances. Each ring is a required part of all strategic alliances. The success of your partnerships will depend upon how well you manage these 3 rings. What strategic alliances can we develop for you? Contact us for a free Partner Audit for one of the 3 types of strategic alliances.